Operation Enduring Freedom was the initial United States military response to the attacks of September 11, 2001, in which almost 3,000 Americans and other nationalities were killed by members of the al-Qaeda terror network. When the Taliban, Islamist extremists who controlled Afghanistan, refused to surrender al-Qaeda leader Osama bin Laden, the United States launched its attack the following month on October 7. The operation, initially named "Infinite Justice," was accompanied by a homeland security military effort named Noble Freedom. A part of Enduring Freedom was Operation Anaconda, an undertaking to root out al-Qaeda and Taliban personnel in northern Afghanistan. With the success of Enduring Freedom in 2002, the United States would go on a year later to the second phase of its war on terrorism: Operation Iraqi Freedom. After the bombing of two U.S. embassies in Africa in 1998, the administration of President William J. Clinton conducted retaliatory air strikes on a terrorist training camp in Afghanistan, where bin Laden was believed to be in hiding. The air strikes failed to neutralize al-Qaeda, however, and after September 11, President George W. Bush demanded that the Taliban turn bin Laden over to the United States. The Taliban stalled for weeks, claiming no knowledge as to bin Laden's whereabouts, while the Bush administration prepared for war. Rather than undergo a lengthy process of obtaining United Nations approval for a multinational force, Bush called on the help of America's major ally among the major world powers: the United Kingdom. (Canada and Australia later also contributed troops to the coalition force.) On October 7, U.S. and British forces launched air strikes against Afghanistan. On October 25, approximately 25 aircraft (including 15 carrier-based tactical planes and eight to 10 long-range bombers) struck seven strategic targets, including military training facilities, surface-to-air missile storage sites, and al-Qaeda infrastructure. By November 9, the northern city of Mazar-e-Sharif had fallen to the Northern Alliance, a loose coalition of Afghan factions opposed to the Taliban. Four days later, a combination of allied air assaults and ground maneuvers by the Northern Alliance forced the Taliban to surrender Kabul, the capital, and on November 17, the Taliban confirmed that al-Qaeda military chief Mohammed Atef had been killed in the allied bombing. Near the beginning of the war's eighth week, on November 25, Central Intelligence Agency officer Johnny "Mike" Spann became the first combat casualty when he was killed in an uprising at Mazar-e-Sharif. Three U.S. soldiers were killed, and 19 wounded, when a U.S. bomb missed its target on December 2. In December 2001, one dramatic phase of the war ended as the Taliban surrendered their last major stronghold in the southern city of Kandahar on December 7. Both bin Laden and Taliban leader Mullah Muhammad Omar apparently escaped from the city. December 16 saw the fall of Tora Bora, a cave complex where al-Qaeda and Taliban holdouts had hidden. Six days later, on December 22, Hamid Karzai was sworn in as chairman of a six-month interim government. Women, treated as slaves under Taliban rule, could again vote, participate in government, and receive an education. Early 2002: Operation Anaconda. On January 4, 2002, U.S. Army Sergeant First Class Nathan Ross Chapman became the first member of the U.S. military to be killed by hostile fire. Fighting continued in spurts until March 2, the launch of Operation Anaconda. The largest ground operation of the war, Anaconda involved some 2,000 U.S., Afghan, and allied troops, and would result in eight U.S. deaths. Its purpose was to eliminate Taliban and al-Qaeda fighters still holding out in the mountains of southeastern Afghanistan. But as the mission came to a close some two weeks later, assessment of its success was difficult. Over the course of an 11-day battle near Shah-i-Kot, for instance, U.S. military commanders had been forced to reassess original estimates of enemy strength in the region upward from 150 or 200 to 1,000. As that part of the offensive came to a close on March 17, it appeared that the U.S. military had produced as many as 800 enemy casualties, but numbers were difficult to determine. In any case, civilian and military leaders were not inclined to evaluate the offensive in terms of body counts—a lesson learned from the Vietnam War a generation earlier. 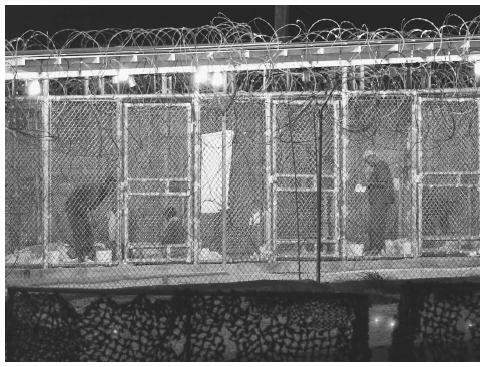 Illegal combatants and terrorist supporters from Operation Enduring Freedom in Afghanistan being held at Camp X-Ray, on the US naval base in Guantanamo Bay, Cuba. broadcasts, to assure the population of Afghanistan that the warfare was directed at eliminating al-Qaeda terrorists, not the practitioners of Islam. Accompanying Enduring Freedom was Noble Eagle, a military operation designed to safeguard homeland security during the war in Afghanistan. The U.S. Coast Guard (USCG), principal guarantors of stateside port security, played a central role in Noble Eagle. USCG deployed 55 cutters (small armed vessels), 42 aircraft, and hundreds of boats to establish port and coastline patrols. It also called up more than 2,800 reservists to support homeland security operations at the country's 361 ports. "Black September 11." Air Force Magazine 95, no. 9 (September 2002): 46–53. Blumenstein, Rebecca, and Matthew Rose. "Name that Op: How U.S. Coins Phrases of War." Wall Street Journal. (March 24, 2003): B1. "Enduring Freedom." New York Times. (August 11, 2002): 4. "Military Operations Named." Marine Corps Gazette 85, no. 11 (November 2001): 4. Thompson, Loren B. "The Lessons of 'Enduring Freedom'." Wall Street Journal. (January 7, 2002): A24. Operation Enduring Freedom. U.S. Army. < http://www.army.mil/operations/oef/index.html > (April 4, 2003). ——. U.S. Navy Office of Information. < http://www.chinfo.navy.mil/navpalib/news/news_stories/pentstruck.html > (April 4, 2003). Operations Enduring Freedom and Noble Eagle. U.S. Air Force. < http://www.af.mil/news/efreedom/index.shtml > (April 4, 2003).